“Every decade, India loses about 20,000 objects to an organised international network of politicians, bankers and smugglers. If one village loss its deity, it affects the whole nation”. 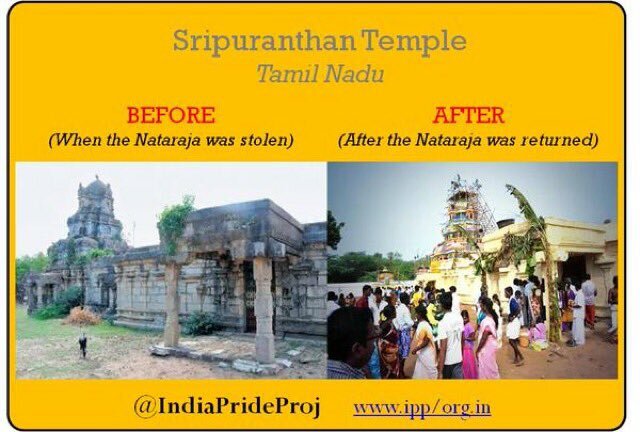 The India Pride Project (IPP) – is an establishment determined to bring back the stolen art and lost treasures of India. Founded in 2013, it is headed by Anuraag Saxena, who currently works as Asia-pacific CEO for the World Education Foundation, UK. The project has a core team consisting of 11 member- all of them engaged in regular full-time jobs in education, banking, business and some are historians. Bringing back lost Indian heritage. They received their first success when the 11th century Chola statue of Sripurnthan Natarajan was handed over to Prime Minister Narendra Modi by Australian Prime Minister Tony Abbot in 2014. The idol was stolen from Bihadeshwara Temple in 2006, since then the temple witnessed reduced number of worshipers. The dancing sculpture of Shiva was smuggled by a New-York based art dealer Shubhash Kapoor. “We told them that if you bought the idol in good faith, which we think they did, you should return it back in good faith” the team informed the museum in Australia and further spread awareness about the situation. “Vijay and I lived outside India for a relatively longish time and we were bowled over by the pride other nations have in their heritage. And some of these aren’t even as ancient as India. We thought about what heritage meant to communities in real India – in villages, a temple or a banyan tree has so much significance – that we decided to do something,” says Vijay Saxena. He further added “Every decade, India loses about 20,000 objects to an organised international network of politicians, bankers and smugglers. If one village loses its deity, it affects the whole nation”. Restitution of 5,000 items in 10 years. Bring back US $50 million of looted artifacts in India in 2 years. “We have a few people within the government and law enforcement departments who like what we are doing and let us know. In many cases, a villager tells us or we come to know when the case is reported in newspapers,” says Saxena on methods of tracing the looted artifacts. “Indian art is sitting in various museums, and we have to study their documents and provenances carefully. The same goes for auction data,” says Vijay Kumar, who is a blogger and general manager of a shipping company. They’ve recently launched an online petition: www.tiny.cc/bogh.